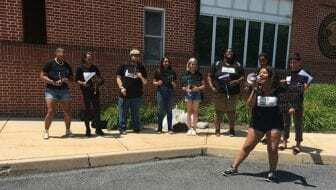 HARRISBURG, PA (WSKG) — The price of being a student in the State System of Higher Education is getting steeper. Citing rising costs, the system’s board of governors has voted to hike tuition next year. The 2.99 percent bump will push PASSHE’s annual in-state base tuition up $224. Kenn Marshall, a spokesman for the school system, said it’s no one’s ideal solution. But PASSHE is facing a nearly $50 million dollar deficit. And while the state has increased its funding for higher education, Marshall said it’s just not enough. The state’s funding level for the PASSHE system is essentially the same as it was before the Great Recession. The three state legislators at the meeting voted against the hike–with Democrats Judy Schwank and Mike Hanna saying they’d support smaller hikes, and Republican Mike Turzai holding fast to a flat rate. PASSHE’s financial woes have been discussed at length in Harrisburg–and lawmakers have proposed various drastic changes, including shuttering one of the 14 schools or consolidating them under larger state-related universities like Penn State. Marshall said the system is against major structural changes.